My husband and I are expecting our first child. We’re good to go if we have a boy, but are utterly stumped if we have a girl. There just aren’t any names that I’m completely wild about. There ar e many that I like, but a lot of them have issues with either being too weird, don’t sound good with the rest of the name, a cousin already used the name, my husband doesn’t like it, etc. 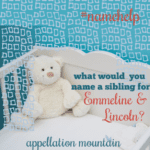 The middle name will be Roselaine and the last name starts with S, ends with n, and is similar to Samson. We don’t want a first name that ends with N, has 3 syllables with stress on the first like Roselaine, is a nature name, has more than one S, or ends with -ra. We also don’t want a name that is too strange or hard to spell or pronounce. We like old-fashioned names that are obviously female and not a nickname for another name. 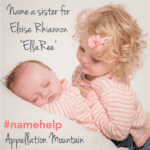 We like nicknames, but for example would name our child Elizabeth and call her Ellie rather than put Ellie on the birth certificate. Wow, does all that rule out a lot! Thank you, and I hope you can help! Congratulations on expecting your first! Here’s the good news: you know exactly what you’re looking for! Sometimes choosing a name is like shopping for a great pair of jeans. It’s easy to rule out dozens of options at just a glance, but finding the right fit requires a lot of effort. That’s okay – we’ll try some on with you! One note: I’m pretty sure you’re pronouncing Roselaine like Rose-Elaine, right? I read it as Rose-Laine at first. I’m not sure if you’re set on pronouncing it Rose-Elaine, but it strikes me that if you have any flexibility on this question, it might help expand your options slightly. Clara – One thing you didn’t mention in your wish list: popularity. Clara currently ranks #99, and I think it’s likely to rise in the near future. (But that doesn’t mean she’ll be one of three in her class! It just means you might meet more Claras than, say, Gertrudes.) The hard C sound of Clara works nicely with the repeating ‘s’ sounds of Roselaine and like-Samson. Dorothy – When it comes to old-fashioned names that are slowly coming back into style, Dorothy strikes me as a can’t-miss pick. It has all the gumption of Kansas farm girl Dorothy Gale, a long list of accomplished real-world women by the name, and sweet nicknames galore. It re-entered the US Top 1000 in 2011, and had climbed to around #650 by 2016; I think it will be up again when we get the new list in May. The related boy’s name Theodore is white-hot, and Thea is leaping up the charts, too. So Dorothy seems like the right kind of compromise: instantly familiar, but not widely used. Georgia – I suggest Georgia an awful lot, but I think it works nicely for your family. It sits in the 200s, a good place for a familiar-but-not-common name. Nicknames like Georgie and Gigi are options, but I know plenty of Georgias who use their name in full. 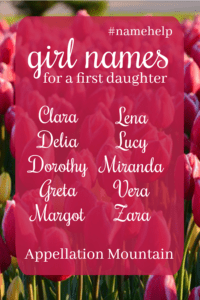 Greta, Margot – Margaret kept coming to mind, and I think it’s a good option. But maybe Greta or Margot, both originally Margaret short forms, works better? Or maybe Margaret is the right name. It’s (obviously!) nickname-rich, with choices like Maggie and Maisie, to name just a few. (Though Maisie might conflict with your surname.) Lastly, Margot’s silent ‘t’ trips some up, but it is, by far, the more popular spelling. Margo fails to make the current Top 1000; Margot is in the 400s. Lena – Lena could be short for a longer name. (Helena, Magdalena … you get the idea!) But it stands nicely on its own, a brief but complete name. It has the sophistication of Sophia or Ava, but in terms of popularity, it’s more like Olive or Lyric. Lucy – There’s something appealing about a shorter name, and I think an ends-in-y pick could work well. Lucy feels gently old-fashioned, and while it’s popular, it may not be in use among your friends and family yet. Like Mary, Ivy, and a handful of other ends-in-y names, it’s not a nickname. But you could potentially use a longer form if that appeals – Lucia and Lucille both come to mind. Lucy does contain the ‘s’ sound, but I think it’s subtle enough to work with the rest of the name. Miranda – Miranda peaked back in the 1990s, but it never cracked the Top 50. The result? Everyone knows the name, but it doesn’t feel like the Jessica-Ashley-Brittanys that defined their generation. A literary name with a great meaning – wonderful – and some fun nickname options, like Miri and Andi, Miranda might belong on your list. Vera – When I’m thinking of names with great meanings, Vera always comes to mind. Depending on your perspective, it can mean faith or truth – auspicious associations, both. Vera checks all the boxes: old-fashioned, not too common, generally familiar, easy to spell and pronounce. Zara – Zara feels more modern than most of the names on this list, but I wonder if it might appeal to you? The downside: you might have to explain that it’s Zara, not Sarah. But I suspect Zara is just familiar enough to sidestep most problems. I think narrowing the list comes down to two things: first, you mentioned you were open to names like Elizabeth-called-Elie. But do you want that kind of formal-name/nickname combination? If so, Margaret and Dorothy are your best bets from this list, and I’m partial to Dorothy Roselaine (like) Samson. Second, do you want to avoid names already used in your circles of friends and family? Or do you want to choose something that’s relatively uncommon? I like Georgia and Margot if you’re after something that’s climbing in use, but hasn’t quite caught on – yet. Readers, over to you! What would you suggest for a girls’ name that goes with Roselaine (like) Samson. Name Help: Everly, Emerson, or Something Else? 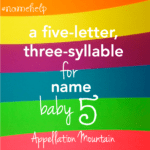 Name Help: 5 letter, 3 syllable name for Baby Five! I like Greta. It’s feminine vintage, and the harder consonants (G & T) nicely pair with and offset Roselaine’s soft consonants (R, S, L, and N). Plus I prefer a two-syllable first name if you’re using a three-syllable middle. I love Delilah for you. It does have 3 syllables but it is easy to write and pronounce and has a fun meaning. I love it with Roselaine. I also suggest Esther. Easy to write and pronounce and is known but not overly used. Why not use Roselaine as her first name? It’s beautiful, and different but not crazy. Every name I think of seems to break at least 1 rule … including this one that I’m going to suggest anyway. It is a lovely old name. Obviously feminine. Nickname rich, but doesn’t need one. Well known but not popular. Three syllables, but the emphasis is on the second syllable. All the letter restrictions apply, except that it does contain more than 1 S – but they’re at the beginning and I think it sounds beautiful with your last name (which is why I suggest it anyway). *Full disclosure – I have a Susannah, she’s 5, we don’t use a nickname at all, we get loads of compliments on her name and I just love it so, so much! Love Georgia or Margot. Also, Lucinda, Lydia, Uma, Edith, Christine/a, Janet, Juniper, Harper, Mary, Julietta, Ruth, Sarah, Beatrix, Matilda, Stella, Zola, Zelda, Kathryn, Liesl, Heidi, Maura, Isabel, Gabriela. However, my favorite option is to use Roselaine as her first name! It’s too beautiful to hide in the middle. So many nn possibilities too. Roselaine is SO gorgeous! I think Stella Roselaine would be gorgeous, I wouldn’t use a name that is heavy on R like Zara/Clara/Vera personally. I think Georgia, Dorothy and Lucia are my favorites among the suggestions. Elinor, Frances, Cecelia? Cressida as a wild card? Yup. Total fail on my part – sorry! I love Georgia (have one!) and Margot was a contender for her sister. Vera is so underused and pretty. I think that’s my vote of the suggestions. Roselaine is so gorgeous BTW. If you’re a family that likes nicknames, I like Paulina Roselaine. Polly! Lena! Posey! Good luck! I prn them like Dor-thy and Deal-ya, so only 2 syllables. Georgia Roselaine is just lovely! Favorite from this list. Amelia- fits your criteria of vintage but not strange at all. Emelia- like Amelia but with a twist and comes with possible cute nickname Emmie. Charlotte- though it’s popular, it’s a lovely choice and sounds really pretty with Roselaine. Meredith- classic and not overused… yet! Emilia (eh-meel-ya) also gets her away from an A initial. My name is Delia (pronounced like Deal-ya) and I have never had anyone bring up the Johnny Cash song. Normally people just remark on ‘how pretty’ the name is. I will say, I rarely come across people who pronounce it correctly; most people will still say Delilah. Regardless, I still love it! I love your name, Delia! <3 We hope to use it as a nn for Cordelia. I just absolutely love Miranda. She offers so many nicknames and her meaning is so lovely. I think she’s an underused gem of a name. I love Georgia! The name sounds particularly lovely with Roselaine. Lucy would also be pretty. Of your suggestions, I like Miranda. I think it flows nicely with the chosen middle and surnames. Two of your suggestions break the ‘doesn’t end in -ra’ rule. Instead or Clara, what about Clare/Claire? I may be biased but it’s a good classic name!